It occurs to me that I am unnecessarily doing something the hard way. Repeatedly. For every new project, I pull out my tape measure to find the right set of lease sticks. The tape measure also helps me select the temple needed for the current weaving width. No more! I do like my tape measure, but why am I measuring these things every time? Why not measure them once and label them? 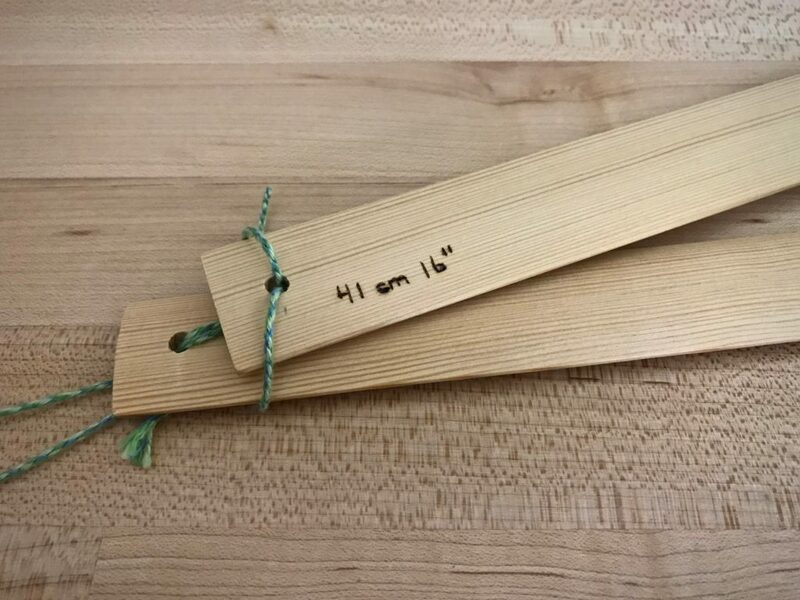 Measure the lease sticks and write the length in centimeters and in inches on one stick of each pair, in pencil. 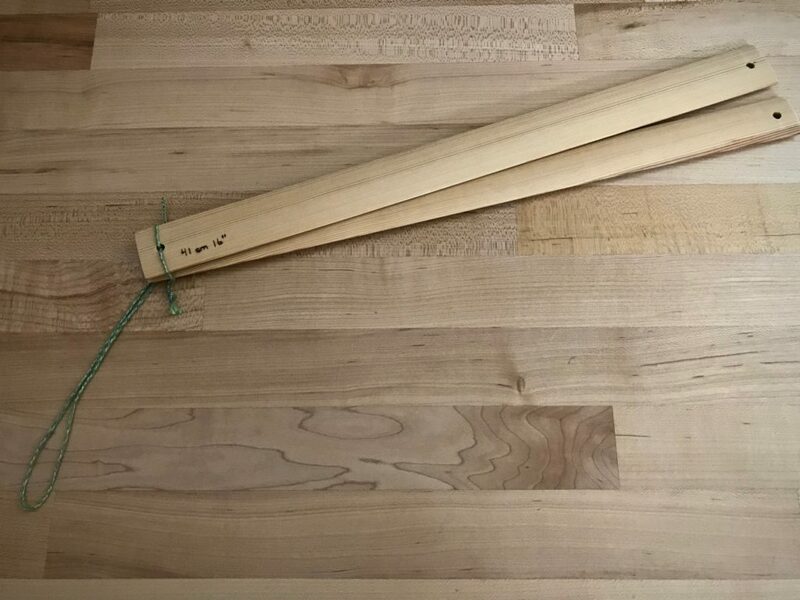 Wood burner is used to write the length measurement on the end of a lease stick. Centimeters and inches are indicated because I use metric or imperial units, depending on the project. Thread a cord through one end of each pair of lease sticks, to keep pairs together. Hang the lease stick pairs with the measurements clearly visible. Looped cord is threaded through the lease stick holes to provide an easy way to hang pairs together. Paired lease sticks, ready for hanging. Pairs of lease sticks hang beside my worktable in my weaving room. 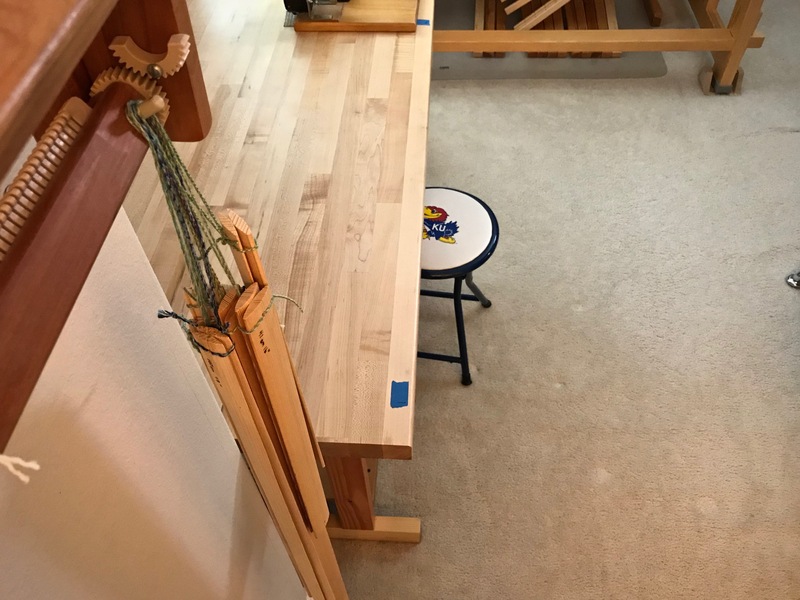 My ol’ Beka rigid heddle loom on the wall happens to provide just the right little hanging post for the measured lease sticks. Look up the temple sizes on a website that sells them, and write the size range in centimeters and in inches on each temple, in pencil. Range of temple widths is important information when I’m choosing a temple. Weaving width of a project must fit in that range. Store the temples in a manner in which the marked measurements are easily seen. No more trying different temples to find one that fits. Now I can look at the markings and select the correct temple the first time. Now I have permanent at-a-glance measurements for each of these frequently-used tools! May you find something to simplify. I am going to start measuring and marking today! Thank you for sharing and may you have a blessed day..
Hi Annie, Good! I’m glad it’s an idea you can use. Great organizing tip! Thanks, Karen! Hi Beth, Now that I’ve done it, I wonder why I never thought of it sooner. i read the whole thing hoping i would see a place to store all those long things that fall all the time, like the reeds, lease sticks and other things. what do you do with those? i knock them over every time i try to use something in the pile. Hi Ellen, I’m still working on a system for storing those long things. Currently, most of them are leaning in a corner of the room or along one wall, where they are out of the way, but accessible. When I get that figured out, I’ll let you know. Hi Elisabeth, That’s fabulous that your daughter can use her gifts to help you! I admire your aim to open up your ears, eyes, and heart. I’m sure you’ll see rewards from that! My floor loom is too large to move set up and has to be dismantled to move. (weekend house to spare bedroom and eventually to the new weekend / retirement house) To make the process easier the corresponding parts of the loom were marked with a @Sharpie. Matching ‘2’ with ‘2’ on a joint made set up easier. 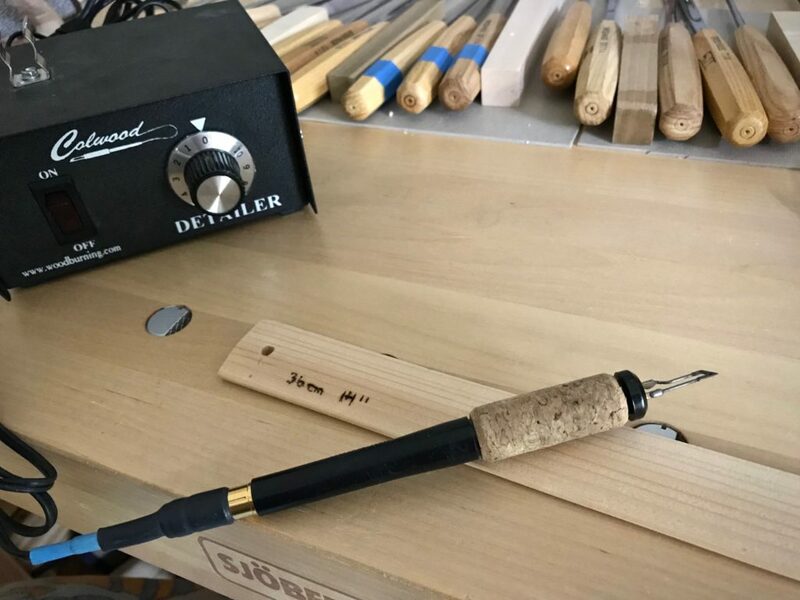 Now I will have to mark the tools and instruments I keep for weaving and set up some hanging hooks. Thank you for direction on so many levels. Hi Nannette, That’s a great idea to mark corresponding parts on your loom to make the tear down and set up process easier! Thanks for sharing! Great idea Karen, sometimes it takes my old brain awhile to think of things, and then wonder why didn’t I think of that sooner?? Hi Liberty, It’s interesting how we get used to doing things a certain way, and don’t notice the easy adjustments we can make in our process. Hi Karen, I have a large ceramic vase shaped like a cylinder that I keep all my stick-like tools in. It is heavy enough that it doesn’t tip over and can sit in the corner so the longest things rest against the wall. It keeps them in one place and it’s easy to pick out the ones I want. I love hearing about your weaving adventures. Hi Fawn, That sounds like a great way to store the stick-like tools. I do something similar. 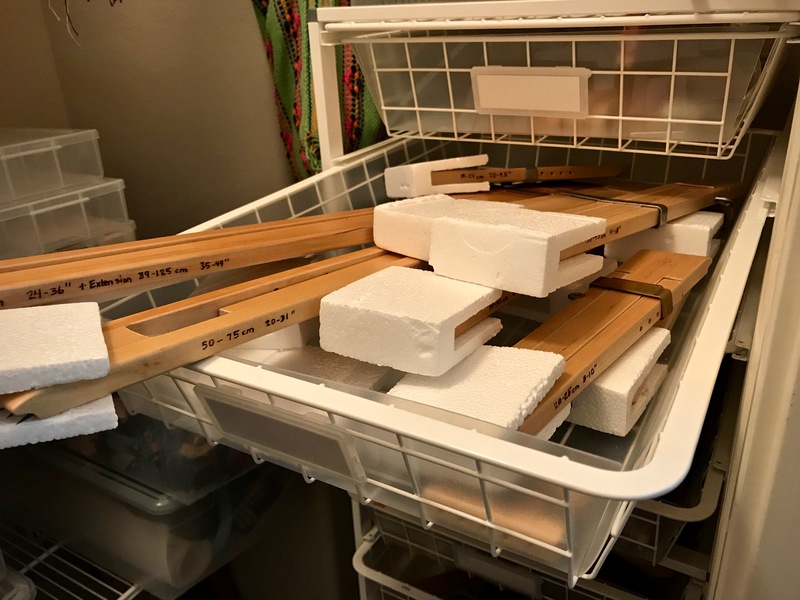 My warping sticks are in a tall-ish small wooden crate that came from the creamery that was down the street from my grandma’s house when I was a child. It sits in the corner, and the sticks in it rest against the wall. I may look for a ceramic vase that I can put by my Ideal loom to hold its sticks. Do your temples fit sitting on the side in the drawer, with the text facing up? 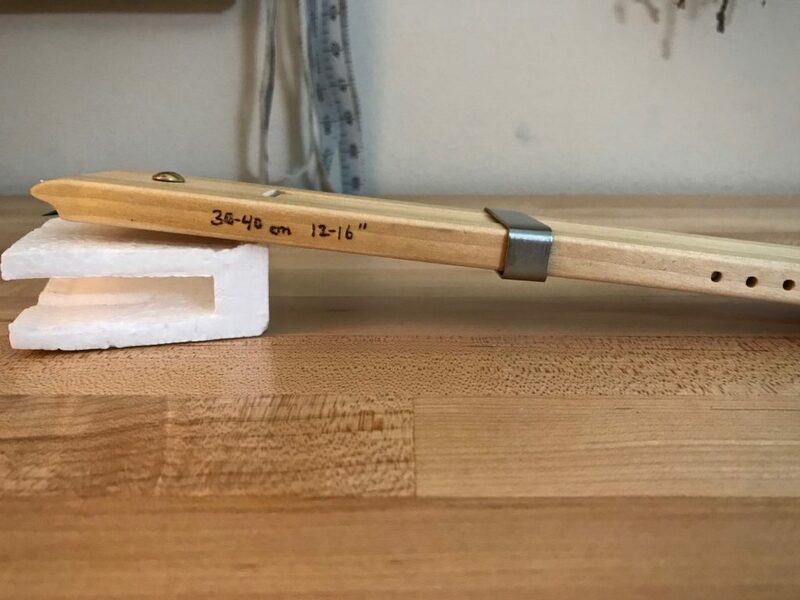 You would see all measurements at once, and it would be easy to grab the one you need. Leave styrofoam with opening on top and lift the temple out, which “saves” the spot for when you put the temple back. Hi Elisabeth, Why, yes, they do fit sitting on the side in the drawer… Which only goes to prove how much I need people like you in my life! And may I suggest hanging your lease sticks on a peg rail of some kind…so easy to grab one set without messing with multiple loops. The peg rail is a great idea. That will probably happen at our hill country place.